What Kind Of Hippo Shopper Are You? The Collector - I'll buy anything with a hippo on it! Looking for a different kind of shoe charm for your Crocs or other holey shoes? This one is for you! It is actually a three-dimensional charm that will sit upright on your shoe, as if you have a hippo head coming out of your foot! 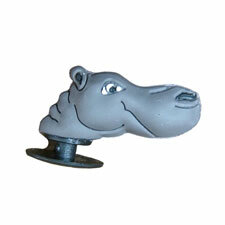 The gray hippo head measures about 1 1/4" and is made of PVC. It will fit various kinds of shoes as well as the new Crocs bracelet wrist bands.